In the center of New Mexico’s stunning landscape is a geological mix of volcanic upheavals with ground shifts that, over time, have created a magical beauty in both the depth and scope of its land. Add in its artsy, cultural combination of Pueblo Indian artifacts, the modern sensibilities of its museums, and the circular carved symbols in sandstone hiding Awanyu, the river serpent, enchanting. Have you seen the ubiquitous Kokopelli playing his magic flute? Compelling symbols indeed. The Burning of Zozobra is a demonstration of sorts. It originated in 1924 by an artist named Will Shuster who created a toothless, gutless and strange-looking man whose mouth is puckered and whose arms fling themselves around. He is rather full of hot air (and crumpled paper). The celebration, Las Fiestas de Santa Fe, is a good one. Jose Chacon Medina Salazar y Villasenor, the Marquis of Penuela who was provincial governor at the time created it under a proclamation. This historical and madcap event is a reminder of the great adventure of Don Diego de Vargas, who re-took the territory of New Mexico almost 325 years ago, following the 1680 Pueblo Revolt. In order to celebrate, the 1920s artistic community wanted to turn this solemn occasion into a rip-roaring event. William Howard Shuster Jr. (1893-1969) decided to create Zozobra for a private fiesta for his artsy friends and their guests. Not one to make things too orthodox, Shuster visited the Holy Week of the Yaqui Indian celebration for inspiration and viewed an effigy of Judas filled with firecrackers. Recordings and notetaking are discouraged at this serious religious ceremony. The Judas on display is bound on a donkey and winds its way through the village, until it is burned. It has a special history, as it is a sacred celebration held around Easter. It takes place in Guadalupe, where you will see black-robed characters with masks and red-tipped swords. Angels are also depicted and a unique dance plays out to the beating drums and tickling bells that fill the air. Shuster came back inspired and proposed his plan for a Santa Fe celebration the likes that no one had seen: The Burning of Zozobra along with, for kicks, the Pet Parade, Desfile de Los Niños. All these years later, the Kiwanis Club of Santa Fe holds the rights to this festival and pageant officials use the burning man, Zozobra, as not only a welcoming adventure into a fascinating spectacle, but also a major fundraiser that helps kids. 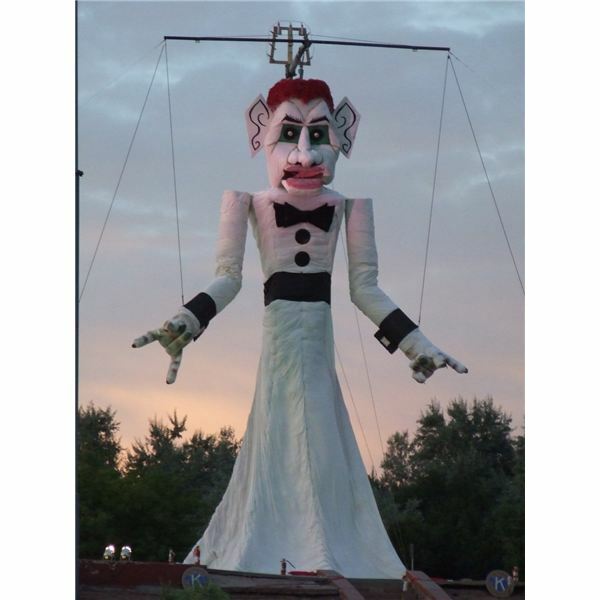 Zozobra holds the biggest position of the fair. He is the evil monster who casts a spell of darkness and despair every year over the City of Holy Faith. In his umbrella of misery, he calls out to all the children to come to him so he can replace the happiness in their minds with despair and gloom. Zozobra has even dressed for the event in his black tie and tux. However, he is angry and yells at all those watching for keeping him waiting. He compels the people to become his evil Gloomies, his minions. This plays out as the actor Gloomies respond to his summons. Then the torchbearers arrive. The symbolic townspeople rise up and they are ready to dispel his evil monster ways. His reign of despair cannot go on; he cannot mystify the children. Fire Spirit was originally embodied by Jacques Cartier, a former New York ballet dancer and teacher who performed the spirit dance for over 30 years. He once talked about how he broke his ankles and how he was almost killed more than 12 times. Today, Santa Fe native Helene Luna is the Fire Spirit dancer who sets the torch to Zozobra to burn in hell. This gigantic wooden and cloth effigy is made of milled lumber, chicken wire and over 70 yards of muslin and weighs more than 2,000 pounds. It is also filled with old police reports, divorce papers, mortgage documents and papers with tales of woe, which are put into the gloom boxes positioned all around Santa Fe and, on performance night, near the stage. The thousands of people who attend wait with high anticipation to see their anxiety burn to ash. Firecrackers go off; the kettledrums pound a solemn beat and Zozobra moans and waves as he burns in retribution for all the sadness he holds. While the creation of Zozobra has changed over the years, the pageantry will never fail to inspire goodness and cheer. Fox, Billy et al. Frommer’s Santa Fe, Taos & Albuquerque. Hoboken, N.J.: Wiley Publishing, Inc., 2011. Book.